As music recording technology changes, so do our expectations of what a digital audio workstation should do. 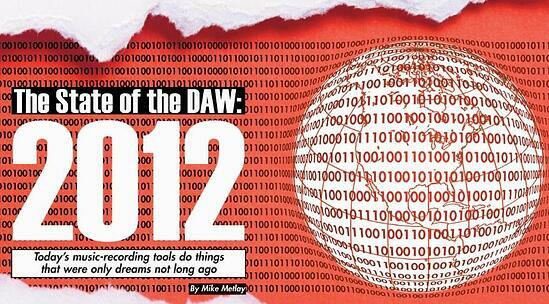 DAWs of 2012 bear only a vague resemblance to the MIDI sequencer programs (with audio tacked on in separate applications if it was there at all) of the 1990s, and no resemblance at all to the multi-thousand-dollar hardware-based monstrosities with custom keyboards and monitors that we meant when we said “DAW” in the 1980s. In 2012, we now have DAWs that do things that were impossible even a few years ago, run on devices that didn’t exist a few years ago, and communicate with the music-making world in ways that would have seemed like science fiction a few years ago... in fact, the whole concept of a DAW needing to communicate with the outside world is something that’s relatively new! Let’s take a moment to consider how your music-recording experience can be enhanced and your creativity boosted by innovations found among the DAWs of 2012. We may as well start with the most obvious change of all: the proliferation of cloud-based DAW features. Just a few years ago, most recording musicians didn’t really even know what the “cloud” was supposed to be, and those that did weren’t always eager to trust it with their precious music. After all, why would you put your tracks up in some amorphous “cloud” of internet-based storage out there somewhere that you didn’t have control over, when it was perfectly simple to keep them on your hard disk? As it turns out, cloud-based music storage and sharing has all kinds of advantages. Once you get past the simple idea of storing your music in the cloud and address how music stored in the cloud can be accessed and shared, the walls of your studio get knocked down and you find yourself working amidst a larger community of musicians that were much more difficult to get to before... assuming you even knew they existed at all. While some might argue that cloud-based music sharing doesn’t yet have its killer app, I would argue strongly in favor of SoundCloud (soundcloud.com). Coming out of nowhere (well, actually from Stockholm by way of Berlin) only five years ago into a music world that was completely dominated by MySpace, SoundCloud quickly rose to prominence as a music-sharing vehicle for over 10 million registered users as of this year. Our older readers are probably scratching their heads at this point and trying to remember whatever happened to MySpace, which was the music-hosting site to beat not too long ago. It’s still out there, but SoundCloud eclipsed it for one very simple reason: SoundCloud made it not only possible but easy for music hosted on the site to be accessed without having to actually go to the site. Musicians could use soundcloud.com for music auditioning and sharing, social networking, chat, forums, and so on, but it was also very easy to put a widget on a website or blog or run an app on a mobile device (ooooh, mobile devices... hold that thought, we’ll get back to them in a minute) and play the music without having to send the listener to a new destination. Suddenly, Joe RecordingMusician could have folks listening to tracks while browsing joerecordingmusician.com rather than having to jump over to myspace.com/joerecordingmusician and navigate MySpace’s not-always-clear web interface to find tracks. Click a button, listen to music.... hard to beat that. SoundCloud has put this basic concept into an API—not the audio firm but an Application Programming Interface, basically a “tool kit” that lets programmers integrate SoundCloud into their programs. Thanks to the SoundCloud API, a lot of DAWs and music programs now have a simple “click here to publish your track on SoundCloud” button. That, in turn, makes SoundCloud even more popular, encouraging more musicians to use it, and so on. In the DAWs of 2012, getting your finished track onto the Internet isn’t a separate process you do later with different programs... it’s a single click. But instant music publishing isn’t the only benefit of the cloud—with the right API, tracks in the cloud can be downloaded into a DAW with equal ease. And not just completed songs, either... pieces of songs, audio loops, stems, unmixed session files, all can be shared between users whose DAWs speak a common language. We have to give a tip of the hat to Digidesign, who made this possible years ago with the Digidelivery system used by top-flight studios sharing Pro Tools session data, but where Digidelivery was proprietary, a bit fiddly to set up and use, and expensive, modern cloud-based sharing is often eclectic, simple, and cheap if not free. A good example of where this process is going is PreSonus Studio One (presonus.com), which we reviewed in June 2012. The latest version of Studio One not only allows publishing to SoundCloud, but also features PreSonus Exchange, a free online forum where users can share Studio One content—audio tracks, sound sets, tutorial and other projects, effects and instrument patches, and more—and it all appears instantly in the DAW’s content browser. And as of this August, Studio One will also let you publish direct to Nimbit (nimbit.com), a one-stop shop for marketing and selling music and merch, including developing fan followings, getting tracks onto iTunes and Spotify, hitting up social media with information about your work... even a virtual tip jar for “superfans” who really want to promote you with extra funds. That’s right, populating your web store and starting to make money from your music, from right inside your DAW. But why stop there? If the cloud is the place to go to share data and move your music around, why not also create your music in the cloud? That’s the premise behind a new breed of DAW out there: the cloud-based collaboration studio. The idea here is that when you work in such a DAW, you’re online and connected to the world at all times. Your tracks are shared with everyone who’s working with you, and you can collaborate and build tracks with musicians a world away in near real time. There are a variety of ways such a DAW can operate. One of them, Soundation Studio (soundation.com), is completely web-based. It runs in your browser and requires little or no special software on your computer. You can get started for free with a small but useful library of online sounds, loops, clips, and MIDI instruments, and by paying a monthly or yearly subscription fee, you can have up to 5 GB of online storage and access to larger libraries of sounds. Another approach is taken by Ohm Force with the new Ohm Studio (still in beta as of press time at ohmstudio.com). The public beta of Ohm Studio is free, and when it ends in October of this year there will be a monthly charge to use the service. Ohm Studio exists as an application on your Mac or PC, a fully fledged DAW that uses your plug-ins and virtual instruments. But it also shares audio and MIDI files with any collaborators you may have on the project you’re recording, has built-in social media like chat and forums, and endeavors to make music creation with sound sharing over the internet completely seamless and natural. These are only two examples of a new type of DAW that we’ll see more of in the coming years, even as existing DAWs get better at integrating the internet into what they do. Make sure your antivirus software is up to date, double-check your firewall, and get ready to have your computer do music as part of a larger world. We mentioned SoundCloud being available as a feature in mobile apps; that’s only one of many ways smartphones and mobile computing devices are becoming more music-savvy. We’ve gone from a few music-listening apps and primitive sequencing platforms to a pretty remarkable range of real musicmaking tools, up to and including a new iOS app called Auria (see the review on page 16) that is a full-on DAW by anyone’s standards. The lion’s share of these music creation programs exist as apps within iOS and run on the iPod touch, iPhone, and iPad; we’ve been regularly featuring them in our iOS Music Tools reviews for nearly two years now, and more cool apps are being released every week. Music recording started very simply on iOS—the first recorders were simple mono, stereo, and 4-track platforms, with basic feature sets. TASCAM (tascam.com) made an iOS version of its original 4-track Portastudio tape recorder available, and what you used to have on a Portastudio was about all you got on the app. But as Apple’s newer iOS releases added CoreAudio and CoreMIDI support and app makers got more sophisticated in their offerings, the market has exploded with some truly amazing offerings. Sonoma Wire Works (sonomawireworks.com) started off with the FourTrack and StudioTrack recorders, simple and easy-to-use 4- and 8-track recorders with built-in mixing, effects inserts, and perhaps most crucially, the introduction of a standard for sharing audio between iOS apps called AudioCopy/AudioPaste. This standard has been adopted by dozens of firms and is rapidly becoming the means of choice for moving recordings, loops, and finished songs from app to app. Other firms have their own takes on audio recording, like Audiofile Engineering (audiofile-engineering.com) whose FiRe Studio app offers editable regions with waveform displays, track markers, and track sharing via SoundCloud or Dropbox (dropbox.com), a generic cloud-based storage system that is gaining popularity in many areas besides music for its ease of use and relatively generous storage amounts (2 GB free, with more added for referrals). And then there’s the other approach to music creation on mobile devices—the all-in-one composing studio that has its own instruments, like NanoStudio from Blip Interactive (blipinteractive.co.uk) and Figure from Propellerhead Software (propellerheads.se). These compact and fun apps often are designed to run on the iPhone and iPod touch and provide a lot of power in a very small space. And then there are apps that combine virtual instruments with audio recording; the killer app in that regard is still Apple’s own GarageBand for iOS (apple.com), but there are some very cool alternatives out there now—check out our review of Tabletop by Retronyms (retronyms.com) on page 44 of this issue. Because the Android operating system doesn’t have a centralized standard for handling audio and MIDI data, music-creation apps for Android got off to a slow start. But the number is growing, and tends to be predominantly in the “collection of virtual instruments” mode, with programs like Caustic by Single Cell Software (singlecellsoftware.com) and ReLoop by NIKO20 (nikotwenty.com) leading the charge. Jaytronix (www.jaytronix.com) makes a 4-tracker called J4T, one of the few pure audio-multitracking apps for Android we’ve found. Naturally, all or nearly all of these apps have the ability to share music via SoundCloud, Dropbox, or other means; since Android OS tends to run on smartphones that can push data over a 3G or 4G phone connection from anywhere, it’s natural and seamless to import and export audio with them. Of particular note is PocketBand (pocketband.net), which uses a social platform and collaboration model for music creators to share their work. The easy portability and low cost of mobile devices combines with their internet integration to make them a natural platform for DAW work, one that we could barely have imagined even a few years ago... and the tracks that are being created on them are sounding good enough to impress a whole lot of listeners. Leaving the outside world and the inside of your jacket pocket, I’d like to step into the world of music itself, and talk about how modern DAWs have broken down one last barrier we never thought would go away: the concept that where intonation and timing are concerned, audio as it’s been recorded is what you’re stuck with. Sure, Auto-Tune (antarestech.com) and Melodyne (celemony.com) have been around for years, and have gradually gotten better, but they’ve always been external tools that integrate with your DAW to do pitch and time manipulation, rather than a seamless part of the DAW workflow. But with modern DAW developments, not only have we begun to see tools for these operations appearing inside the DAWs themselves as part of the feature set, but they’ve gotten so good at what they do that we are starting to take them for granted. MOTU (motu.com) may have been the first company to write its own intonation control software for use inside a DAW with Digital Performer, but many of the major DAWs have followed suit. Cubase 6.5 (steinberg.net) has added an integrated and easier-to-use time manipulation/warp control system (and SoundCloud support! ), SONAR X1 (cakewalk.com) has a new version of AudioSnap that improves audio quality while boasting an improved user interface, Pro Tools (avid.com) has Elastic Pitch and Elastic Time, PreSonus has avoided the issue of writing its own pitch correction software by integrating Melodyne into Studio One 2.0... the list goes on. Just because you can... should you? And the quality of these processes is staggering. We’re not yet at the point where pitch changing can perfectly manipulate formants and turn a male vocal into a female or vice versa, but many other pitch manipulations that were previously thought to be impossible are now routinely performed, to the point where some engineers worry about whether it will be necessary for a studio musician to actually be able to play his or her instruments any more. We’d like to believe there’s always going to be a place for real musicianship and that no computer can ever fudge a great performance from garbage... but when you hear a strummed chordal guitar part in C Major get turned into C Minor with a few clicks of a mouse, you start to wonder if anything is truly out of reach. And when you have a great performance that’s marred by a few bad notes or one area that’s slightly off-time, it’s comforting to know that those little mistakes no longer mean trashing the entire take. There are lots of other areas we could touch on if we had more space, like the creation of the first really new plug-in formats in some years (AAX for Pro Tools and the new Rack Extensions third-party plug-ins for Propellerhead Reason). But for now, we’ll close with the understanding that as long as technology’s changing, we’ll find new ways to use it to make music, and the landscape’s unlikely to get boring any time soon. Mike Metlay would like to thank Beto Hale, Darwin Grosse, and Giles Reaves for useful discussions on these topics.